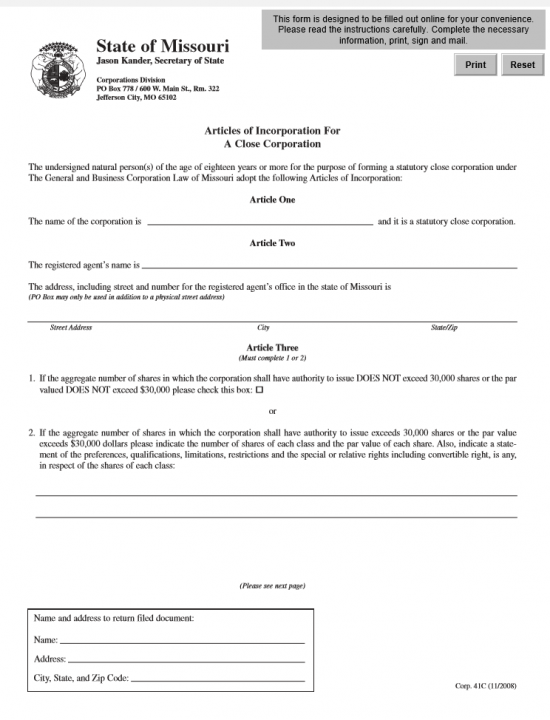 The Missouri Articles of Incorporation of a Close Corporation | Form 41C is a form designed specifically for Incorporators of domestic close corporations. Close corporations will tend to have a smaller or tighter corporate structure and depending upon the type of close corporation, some may have a specific criteria to satisfy with both the Missouri Secretary of State as well as other entities. Thus, Incorporators should make sure to take every measure in their research of forming such a corporation, including a consultation with an attorney or an accountant. The Missouri Articles of Incorporation of a Close Corporation should be mailed in with a check to cover the Filing Fee. The Filing Fee will depend upon the number of Authorized Stock and the Value of that Authorized Stock. It will be $58.00 if the authorized stock is under 30,000 shares or under $30,000. If this is not the case, then you must pay the base $55.00 Filing Fee for the first $30,000 worth of shares plus $5.00 for every $10,000 above this first $30,000. Add a $3.00 processing fee to this. The check must be made payable to “Director of Revenue” if filed by mail. If filing electronically, you may pay with a credit card. Step 1 - Select the Download Application link above or click here: Form Corp 41C. It is strongly recommended to download this form as opposed to opening it and working on it. You may use a PDF program to enter the information required or you may print it then fill it out. All the items must be fully reported, if there is not enough room continue that item on a separate sheet of paper that is clearly titled. 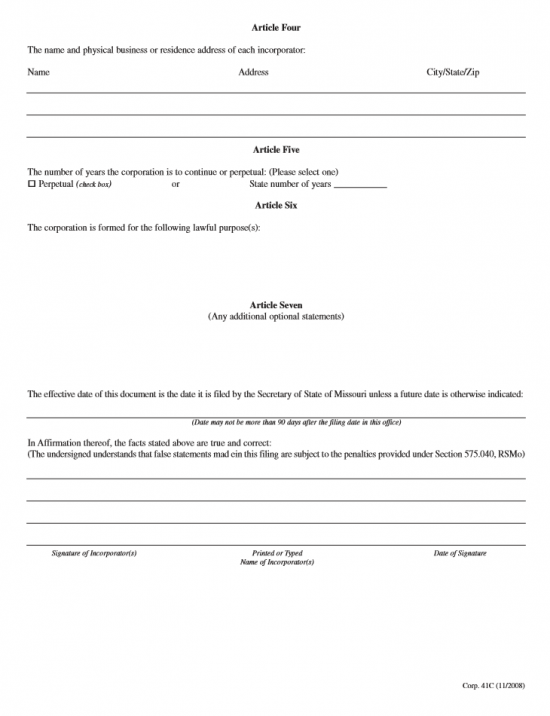 Step 2 - Locate Article One, then enter the Full Name of the close corporation being formed on the blank space provided. Step 3 - In Article Two, enter the Full Name of the Registered Agent obtained by the close corporation on the first blank line. Step 4 - On the second blank line of Article Two, you will need to enter the Full Address of the Registered Agent’s Registered Office in Missouri. This may not be a P.O. Box and must be where the Registered Agent is physically found. Step 5 - In Article Three, it will be time to define the Authorized Stock this close corporation may issue. This will determine the Filing Fee for this corporation. If the aggregate number of shares is less than 30,000 and the value of the those shares is less than $30,000 then you may check the box in the first Item. The filing fee for this will be $58.00. If this is not the case however, you will need to define each class along with its preferences, qualifications, restrictions, special rights and/or limitations for that class along with the par value for the shares of that class in section 2. If this is the case, you will need to follow the steps below to calculate your Filing Fee. Step 6 - Next, in the box at the bottom of the page, enter the Name and Address of the desired Recipient who you wish to receive the Certificate of Incorporation or other correspondence regarding these articles. This will contain a line for Name, Address, City/State/Zip Code. Step 7 - In Article Four, each Incorporator must have his/her Full Name and Full Address documented on the blank lines provided. Step 9 - In Article Six, report the Purpose of this corporation by defining why it is forming and how it will transact business in the State of Missouri as a close corporation. Step 10 - In Article Seven, you may document any additional provisions necessary for the formation of this close corporation in the space provided or attach as a separate document (labeled as “Article Seven”). Make sure to note the attachment in this space, if this is the case. Step 11 - If you wish to define an Effective Date as opposed to using the Filing Date, enter the desired Date of Effect on the blank line below the statement beginning with the words “The effective date of this document…” You may select any date that is within 90 days of the Filing Date. If you do not wish to have a separate Effective Date in the future, you may leave this line blank. Step 12 - Finally, on the blank lines beneath the paragraph beginning with the words “In Affirmation thereof,” each Incorporator must provide his/her Signature, Printed/Typed Name, and Date of Signature. Step 14 - You may mail the submittal package (consisting of payment of the Filing Fee, the Missouri Articles of Incorporation of a Close Corporation, and any required documents by regular or express mail.